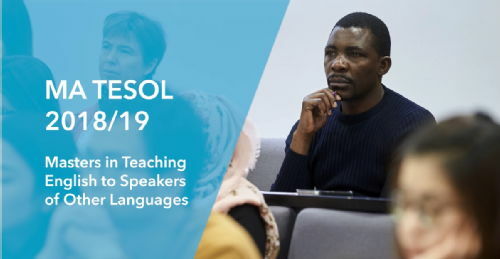 Teaching English to Speakers of Other Languages (TESOL) requires not only a good mastery of the English language but also a good understanding of methodological approaches and the connections between research, theory and professional practice. Applied Linguistics at Warwick has a proven track record with over 30 years of training students from around the world in English Language Teaching (ELT). This brand new MA TESOL programme (from 2018) demonstrates our commitment to continuing innovation and offers course features that will appeal to those who want to advance their career in English Language Teaching. The new structure allows us to capture new, cutting edge developments and showcase staff expertise at its best in an ever growing range of specialist areas. Assessment of all the programmes is by coursework and final dissertation.There are no formal examinations. A 15,000 word dissertation is the final piece of assessed work. Students are encouraged to select a dissertation topic relating to linguistic or professional dimensions of the programme in which they have a particular interest and they are often able to relate their research to their existing or intended professional role. What work will I be doing on the MA TESOL? Courses are taught by means of lectures, seminars, workshops and tutorials. There is extensive guided reading and a number of written assignments. These assignments may be very varied in nature. Some are in the form of long essays, some incorporate analytical exercises with texts, some involve writing portfolios of material with a range of aims and focus. The Research Methodology module occupies an important position in the programme. As well as providing a broad overview of research in English language teaching, this prepares students to carry out research for the dissertation with the support of a supervisor. Within the degree, there is ample opportunity for students to tailor their own programme in accordance with their professional and academic aspirations and experience. Individuals may select options, specialist modules, assignment topics and their dissertation topic in accordance with their own particular interests or context. What are the typical backgrounds of the students on the MA programme? In recent years, our MA has attracted students from the UK, Western and Eastern Europe, Africa, the Middle East, South, South East, East and Central Asia, North, and South and Central America. Students come from a variety of academic and professional backgrounds. Some have come straight from university. Others are experienced teachers and many have had a substantial professional record. They may have previously worked as teachers and heads of department in primary and secondary schools, colleges and universities; as curriculum developers, inspectors and administrators in Ministries of Education; as teacher trainers in colleges and universities; as teachers of English for Specific Purposes in universities, colleges, private schools and companies. Many former students now occupy senior positions throughout the world.